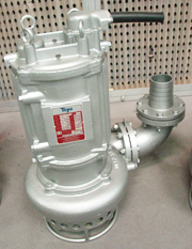 Toyo VH pumps are very heavy duty submersible slurry pumps. The design of the pump associated with the powerful Toyo SP motor allows the pump to be both air and water cooled. Partial immersion is therefore possible. 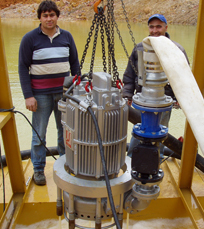 These pumps incorporate the renowned patented Toyo agitator, attached directly on the pump shaft, semi-open impeller, large open passages for the easy passage of solids, heavy duty shaft and bearings configuration, double mechanical seals working in an oil bath and 4 pole customs built electric motor with 1.25 service factor. VH15 and bigger models are equipped with an adjustable wear plate which allows optimizing hydraulic efficiency of the pump. The impeller, the wear plate and the agitator are manufactured in cast chrome iron (24 to 28%). 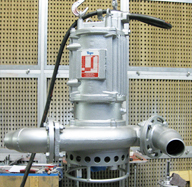 These pumps have a side outlet discharge but can also be ordered in special versions with 3 outlets for pumping and mixing operations (models : VHA and VHJ). High head versions are also available. VH pumps are able to lift up and transport slurries with densities of at least 1.25kg/dm³ and can handle solids content reaching 55% by weight. 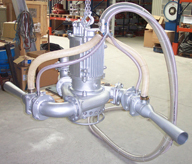 They offer pumping capacities of up to 210m³/h. They can handle solids particles with up to 45mm diameter, in slurries temperatures of up to 60°C and pH between 4 and 9.5. They are available in high temperature versions for slurry temperature of up to 80°C and in different metallurgies, including stainless steel.